A traffic enforcement operation Tuesday focused on the drop off and pick up points along the school bus routes for six local schools. 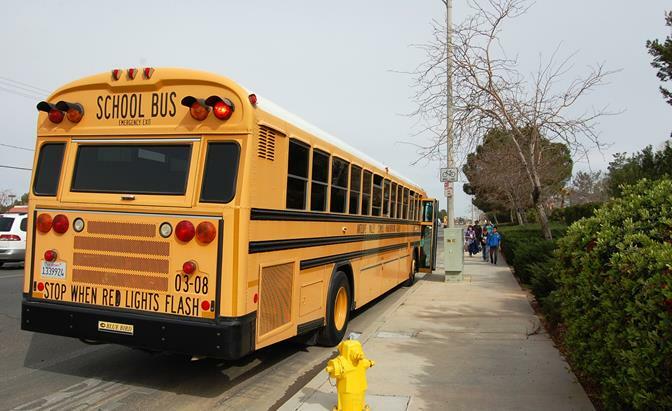 LANCASTER – Three motorists were cited for failing to yield to a school bus and a dozen other drivers were cited for various moving or equipment violations Tuesday during a traffic enforcement operation conducted by the Lancaster Sheriff’s Station, authorities said. Motorists yield to a stopped school bus on Avenue L near 28th Street West. Had the drivers passed the school bus, they would have been immediately cited. Ruiz said Tuesday’s operation targeted the pick-up and drop-off points along the school bus routes of six local elementary and middle schools – Piute Middle School, Joe Walker Middle School, Del Sur Elementary School, Valley View Elementary, Sundown Elementary, and Joshua Hills Elementary. “There have been some complaints from bus drivers and other citizens that motorists are not yielding to the buses, which is creating a big danger for the children,” Ruiz continued. In a recent tragic case, 14-year-old Eastside High School student Gage Rossi was hit and killed by a car as he crossed the street to catch his school bus on February 14. The car was passing the stopped school bus at the time of the collision, authorities said, but they’re still investigating whether the stop sign and flashing lights on the bus were activated. Read more here. 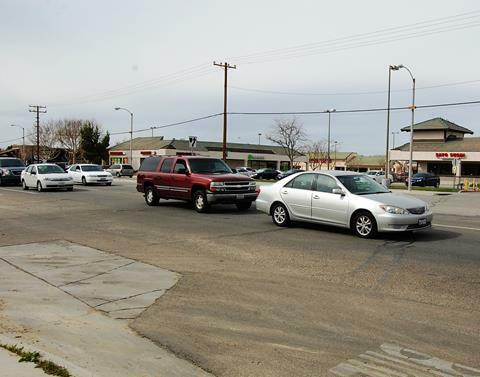 The three motorists cited for failing to yield to a school bus Tuesday could face up to nearly $500 in penalties for the violation, Ruiz said. There will be similar enforcement operations in the future targeting other local schools and school bus routes, Ruiz said. 6 comments for "Traffic safety operation nets 15 citations"
For those who got tickets from the opposite on-coming direction read this and get your money back! Nobody fights this so the police keeps citing…you only have to stop and yield to school bus if the road is a 2 lane Hwy, 1 lane either direction till red flashing lights stop. If your road is a 4 lane Hwy, 2 lanes either direction then only the lane that the school bus is on must stop and yield to the flashing red lights not the other side or opposite side, the other side must slow down but can proceed with coming to a complete stop. Lancaster Sheriffs owes some people ticket refunds. 22454. (a) The driver of any vehicle, upon meeting or overtaking, from either direction, any schoolbus equipped with signs as required in this code, that is stopped for the purpose of loading or unloading any schoolchildren and displays a flashing red light signal and stop signal arm, as defined in paragraph (4) of subdivision (b) of Section 25257, if equipped with a stop signal arm, visible from front or rear, shall bring the vehicle to a stop immediately before passing the schoolbus and shall not proceed past the schoolbus until the flashing red light signal and stop signal arm, if equipped with a stop signal arm, cease operation. (b) (1) The driver of a vehicle upon a divided highway or multiple-lane highway need not stop upon meeting or passing a schoolbus that is upon the other roadway. (2) For the purposes of this subdivision, a multiple-lane highway is any highway that has two or more lanes of travel in each direction. (c) (1) If a vehicle was observed overtaking a schoolbus in violation of subdivision (a), and the driver of the schoolbus witnessed the violation, the driver may, within 24 hours, report the violation and furnish the vehicle license plate number and description and the time and place of the violation to the local law enforcement agency having jurisdiction of the offense. That law enforcement agency shall issue a letter of warning prepared in accordance with paragraph (2) with respect to the alleged violation to the registered owner of the vehicle. The issuance of a warning letter under this paragraph shall not be entered on the driving record of the person to whom it is issued, but does not preclude the imposition of any other applicable penalty. (2) The Attorney General shall prepare and furnish to every law enforcement agency in the state a form letter for purposes of paragraph (1), and the law enforcement agency may issue those letters in the exact form prepared by the Attorney General. The Attorney General may charge a fee to any law enforcement agency that requests a copy of the form letter to recover the costs of preparing and providing that copy. Amended Ch. 1296, Stats. 1990. Effective January 1, 1991. Amended Ch. 624, Stats. 1992. Effective September 14, 1992. Amended Ch. 589, Stats. 1993. Effective January 1, 1994. Amended Sec. 3, Ch. 647, Stats. 1999. Effective October 10, 1999.